Are you looking for meat charts? Want to learn where a porterhouse steak comes from on a cow? Where a pork chop comes from on a pig? What’s the difference between the short loin and the sirloin? 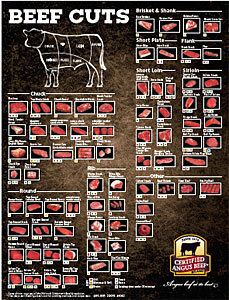 Our companion website The Virtual Weber Bullet has a collection of over 20 meat charts for beef, pork, lamb, and goat. You can view each one online or download to print. These are great resources and I hope you enjoy them!